[107 Pages Report] The massive MIMO market was valued at USD 1.11 Billion in 2017 and is expected to reach 20.91 Billion by 2026, at a CAGR of 41.6% during the forecast period. 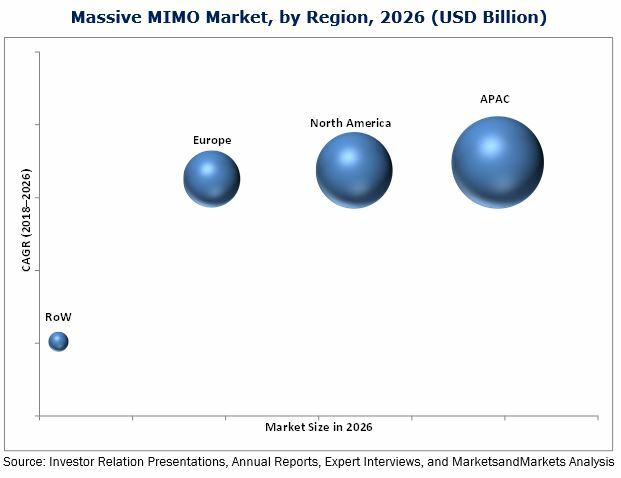 The growing demand for high data rate speed, low latency, easy synchronization with the previous generation technology, and consistent connectivity, among others, are the key factors driving the massive MIMO market. The base year considered for the study is 2017 and the forecast period considered is between 2018 and 2026. The objective of the report is to provide a detailed analysis of the massive MIMO market on the basis of spectrum, technology, type of antennas, and geography. 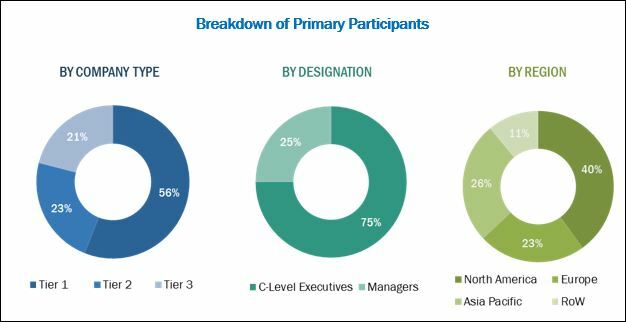 The report provides detailed information regarding the major factors influencing the growth of this market. The massive MIMO ecosystem comprises manufacturers, system integrators, and distributors. The players involved in the development of massive MIMO include Nokia (Finland), Ericsson (Sweden), Huawei (China), ZTE (China), Verizon (US), Sprint (US), Airtel (India), China Mobile (China), and Deutsche Telekom (Germany). This research report categorizes the global massive MIMO market on the basis of spectrum, technology, type of antennas, and geography. The massive MIMO market is expected to be 1.29 Billion in 2018 and is projected to reach USD 20.91 Billion by 2026, at a CAGR of 41.6% between 2018 and 2026. The growth of this market is driven by the rising importance of software implementation in a communication network and high signal to noise ratio. The TDD spectrum segment led the massive MIMO market in 2017. With high data rates and a huge capacity for data and HD voice, TDD significantly improves customer experience and lowers the operator’s cost per bit. TDD also provides spectrum flexibility. TDD runs on multiple spectrum bands with a bandwidth of up to 200 MHz in a single band. These enable easier roaming, high capacity, and high user throughput with carrier aggregation. The 64T64R type of antennas segment led the massive MIMO market in 2017, as most companies in the market use the 64T64R type of antenna in their testing and deployment, which is the major factor for the large market size of this segment. With massive MIMO radios using 64T64R antennas, Sprint can drive the capacity of massive MIMO beyond 1 Gbps to reach 3-6 Gbps per sector. The LTE Advanced technology segment accounted for the largest share massive MIMO market in 2017, as this technology helps resolve bandwidth issues, which occur mainly due to the presence of millions of users on a single carrier service. The 5G technology segment is expected to witness the fastest growth during the forecast period, as it is expected to enable new high-frequency bands that suffer high propagation path losses to deliver similar coverage as low frequencies. Moreover, 5G is expected to offer significant gains to accommodate more users at higher data rates with better reliability while consuming less power. APAC led the overall massive MIMO market in 2017. China is one of the most important countries for massive MIMO. Chinese players Huawei and China Unicom together have completed the field verification of the industry’s first FDD LTE-based massive MIMO technology, using an existing two-antenna receiving terminal operating with 20MHz of spectrum. The lack of standardization of spectrum allocation is one of the major restraints for the massive MIMO market. The standardization of spectrum allocation across regions is extremely important for the development of the massive MIMO infrastructure, as it has a huge impact on the economies of scale and offers clarity to equipment vendors to develop products. Market players such as Huawei Technologies Co. Ltd. (China), Nokia Corporation (Finland), Verizon Communications Inc. (US), ZTE Corporation (US), and Ericsson AB (Sweden) are focusing on product/solution launches and developments, partnerships and collaborations to enhance their product offerings and expand their business.